Increasingly, European citizens consume television content together with devices connected to the Internet where they can look up related information. In parallel, growing amounts of Linked Open Data are being published on the Web, including rich metadata about its cultural heritage. Linked Data and semantic technologies could enable broadcasters to achieve added value for their content at low cost through the re-use of existing and extracted metadata. 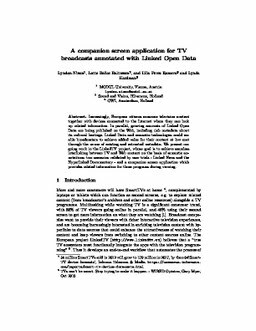 We present ongoing work in the LinkedTV project, whose goal is to achieve seamless interlinking between TV and Web content on the basis of semantic annotations: two scenarios validated by user trials - Linked News and the Hyperlinked Documentary - and a companion screen application which provides related information for those programs during viewing.